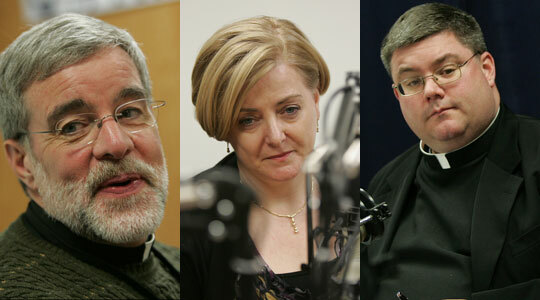 Today’s guest(s): Kathy Greenler Sexton and Fr. Peter Gori from St. Augustine Parish, Andover, Mass. Summary of today’s show: Scot and Fr. Chris talk with Kathy Greenlar Sexton and Fr. Peter Gori about the difficult topic of miscarried and stillborn children; the anger and spiritual questions that many parents experience; and the unique ministry that St. Augustine Parish in Andover offers through an annual Memorial Mass for Miscarried Children and their Families. During the show, Kathy discusses her five miscarriages and the pain and anger she felt even when she didn’t know where to turn for spiritual consolation and when the healthcare professionals didn’t have any to offer. Fr. Peter also offers words of hope in what the Church truly teaches about the children who die during pregnancy and the healing offered to the grieving. 1st segment: Scot welcomed Fr. Chris back to the show. The sad news is that St. John’s Seminary’s softball team lost their game versus Blessed John XXIII National Seminary in Weston. They compared the loss to the collapse of the Boston Red Sox. Fr. Chris will have to report the loss to the alumni during their annual dinner on Friday night. It’s a wonderful night for the priests who serve throughout New England to come back to be examples for the seminarians and who leave encouraged by the future prospects for the Church. Scot said the seminary has been open since 1884. Fr. Chris estimated that there have been more than 900 priests who are currently alumni and they are expecting 100 to come to the dinner. Fr. Chris mentioned this evening that the Theological Institute for the New Evangelization at St. John Seminary is having an open house this evening at St. Gabriel Church across from St. Elizabeth’s hospital in Brighton. This is for anyone thinking of taking a degree program to learn and grow in their faith. Scot said today’s show topic is the Church’s response and our response for those who lose a child to miscarriage. One in 5 people experience this sad situation themselves. This year for the second time, St. Augustine Parish is offering a Memorial Mass for Miscarried Children and their Families on Saturday, November 5, 9:30am. 2nd segment: Scot and Fr. Chris welcomed Fr. Peter Gori, pastor of St. Augustine in Andover, and Kathy Greenlar Sexton, a parishioner, to the show. Scot said Fr. Peter was an associate pastor at St. Augustine in the 1980s. He was there from 1988 to 1993 after his doctoral studies in Rome. He also serves on the Metropolitan Tribunal as a canon lawyer. Kathy said she and her husband Sean grew up in the area. And after living in Chicago for a number of years they returned to the area, specifically the Merrimack Valley where many of their family live. Fr. Peter said it’s a big and busy parish, especially with the number of children. They have 1,200 children in religious education and 440 in the parochial school. Kathy started in broadcast television and worked with high-tech companies in marketing. She was part of the founding team of the Altavista search engine. She has worked with top websites since then to help them grow their businesses on the web. Kathy said it was a lot of fun working at the beginning of the Web. Kathy has suffered through five miscarriages. When she came to St. Augustine, she asked Fr. Peter to start a public remembrance. Scot asked her how she began this apostolate. She said when they moved to Chicago, she was pregnant, but they were devastated when they lost that child. They’ve had five pregnancies and five miscarriages. Their experience is not unlike others in the same situation with the extreme grieving process and issues of anger, resentment, and loss. With each miscarriage those feelings deepened along with the physical issues that went along with and the emotional issues of depression. It was difficult dealing with Mother’s Day and the question about whether she had children. Then there were the spiritual issues of where are her children and being angry at God. She researched these questions online and asked questions of her priest and found no consistent answers. She found a lot of pain and questions from other women like herself who didn’t know where to turn. She went to a healing service at St. Marie’s in Manchester, NH, and one woman praying over stopped mid-prayer and told her the Lord wanted her to name her children. That process was cathartic. It turned the child from something abstract into a human being. and then the last miscarriage, her parish priest invited them to come down on a Saturday morning and remember those children. Fr. Michael Hobson, then at St. Agnes in Middleton, had a Mass in remembrance of those five children for Kathy and her family and it was very cathartic. Once she went through the healing process, she could feel the healing and being lifted up. When they moved to St. Augustine parish, she asked how she could bring that healing experience to others. She also through that it was a great way to show people who we respect life from conception. So she figured out who is the woman in the parish who gets everything done. She reached out to her and they brought the idea to Fr. Peter. They had the first Mass last year and the conversations with people has convinced her to try to get the word out about this. People are challenged spiritually and emotionally by this experience and people could benefit from this healing. Scot said he sees how they were experiencing a lot of emotion, but not connected to the liturgical life of the Church. Losing a child five times without the liturgical rites of the Church to help us grieve along with the love of our community and family is a challenge. Scot said he is also struck by the question of “where is my baby” and the theological questions. The power of naming the baby is key to personalizing him. Scot asked Fr. Peter what is the Church’s teaching on where the child is after miscarriage. He said the Church teaches life begins at conception and everyone of these entities is a human being whatever the medical terms are applied to him or her at each stage of development. If they die prematurely through miscarriage or being stillborn, we believe that person is enveloped completely in God’s love. God welcomes each and everyone of these children into the fullness of his life in heaven. Scot said it’s appropriate to pray to the children, believing that they are present before God just like the saints. Fr. Peter said they collect cards during the Mass with the names of the children and bring them to a convent of Poor Clare nuns who pray for them during November. One woman said they should pray to the children, asking for their prayers. Scot asked about the Mass itself. Fr. Peter said they invite people in and give them a copy of the program and let them sit where they are comfortable. The lighting is subdued with gentle music in order to create a prayerful atmosphere. Fr. Peter then explains how the Mass will unfold. It will begin in the usual way. After the Liturgy of the Word and the homily, they invite those present to bring forward a card with the child’s name or to give the child a name if they haven’t done so yet. They bring it up during the Presentation of the Gifts and place it in the hands of one of the priests. The priests place it in a basket. Then the Mass continues as usual. Scot said since Roe v. Wade there’s been a devaluation of human life in the womb, creating euphemisms for the baby. He asked Kathy when she did the naming of the children and what advice she might have for moms and dads who lost children or even just found out they’re pregnant, the benefits of naming the child. Kathy said during the medical procedures, they refer to the baby as a fetus and they use very technical terms. She was rushed through the medical process and didn’t have time to think about the spiritual implications. She was still thinking about her child dying and didn’t have time to think about the spiritual questions. Only later did she start second0-guessing herself. The process of naming the children personalized each one of them and gave her someone to think about. The medical process de-personalizes and the naming process humanizes. It allowed her to envelop all the emotions at a human level. Scot said one of the comparisons is to losing a mom or dad in the hospital, but then you get a chaplain brought to you to help you deal with it. But with a miscarriage, there isn’t the same care to bring in the deeper connections of our relationship with God. Kathy said her first two miscarriages while she was working with an obstetrician who was very much into her emotional well-being, but the medical personnel weren’t believers and seemed cold. She asked for a priest, but was told no one was available and they said they would pray over the remains. The third and fourth miscarriage, she was seeing a specialist for high-rick pregnancy and felt there was more care for her. Yet even here, they were still very cold. She woke up in the middle of the procedure and saw everything. They didn’t bring her a priest despite her request and the child was going to the pathology lab whatever her wishes. The questions that haunt her about her decisions and actions are similar to those of other women who’ve experienced it. Another woman told her that she had a miscarriage 25 years ago and was so angry at God that she never went back to church. That motivated Kathy to help people and provide honor to the children and healing to the families. Fr. Chris asked Kathy about the dad’s experience in all this. She said that her husband Sean feels loss, but it’s different than her own. But he had the hopes and dreams of those children too. His arms are as empty and aching on Father’s Day as hers is on Mother’s Day. Dads suffer too. The Mass of Remembrance is for mothers and fathers and families. One man came to the Mass last year to honor a brother who died many years ago. Fr. Chris said in dealing with teens and working with youth groups, sometimes it comes up that they want to talk about a brother or sister, either stillborn or miscarriage. It’s often a teen who will relate a story of great sadness where you had no sense that this is a cross the whole family has been carrying. Kathy said she’s unusual in her desire to talk about this. Most people won’t talk about it. You’re expected to get on with your life. People have said it to her, but she has felt deep loss through the loss of a child. You can’t just forget. Scot said you can trick your body, we need to grieve physiologically. Society has a fear of talking about death. 3rd segment: Scot asked if its possible or appropriate to ask the healthcare provider to receive the remains to bury the child. Kathy said in hindsight it’s absolutely appropriate. She thinks they should bring in the pastor to help this process. There’s a lot of confusion and there’s a challenge in that the medical community is programmed to follow particular procedures and when we express our faith in particular not everyone will be supportive of that. It’s okay to get help from the pastor. You also don’t need to do something right away, but take time to figure out what’s best for you and your family. Fr. Peter said it is appropriate to ask for a funeral Mass for a miscarried or stillborn child. His experience is most people want a more private ceremony. Sometimes, the remains are not available due to the medical staff not taking steps to ensure they are. Fr. Peter said every pastor needs to want to be able to provide pastoral support in this area, but needs to do so with a lot of gentleness. As a celibate male, he can’t know exactly what this is like for the mother or father. He needs to reverence the whole experience and tread softly, whether it was recent or long ago. Scot asked if it’s appropriate to have the memorial Masses. Fr. Peter said it can be good for some, but the communal aspect of this Memorial Mass they’re planning does more by bringing people together. That experience of being understood is a big part of why it contributes to the healing of people. It is not shameful or secret or lonely. You need to bring the painfulness of this together to help people in the healing process. Fr. Chris said each couple is so unique and different. As newly ordained priest, he was present with a couple as they buried twin daughters. It was difficult to explain this sad mystery to them, but they anted and need the Church. The Church needs to be a part of this. This mother visited regularly the cemetery and asked the children to pray for her. Fr. Peter said in many Catholic cemeteries there is a specially designated place for the interment of children, especially the stillborn. The traditional arrangements of a funeral could be an added burden, so special accommodations are often made. Scot said too often it’s difficult to talk about this experience with people who have not experienced it. He asked Kathy what people who live too far from Andover to attend this Mass can do in their own parish. She said the most effort is to call the pastor and get on his schedule. She said Fr. Peter really thought through the liturgy and the service is very moving. Anyone who feels they want a similar service in their parish should call their own pastor. She’s sure their pastor will bring the same love and caring into a Mass of Remembrance for them. But if anyone can make the trek to Andover, they will be welcomed with open arms and they could perhaps take some of what they’re doing back to their own parish. Scot made clear that this Mass is open to everyone. Anyone who is at a point in their healing to attend a Mass in remembrance of the children should come. Fr. Chris made sure to note that no one would be put on the spot. They are coming to be consoled. Fr. Peter pointed out that presenting the names to the Poor Clares extends the prayerful support of the Catholic community so that it is ongoing. It shows how the Poor Clares continue to pray for all of us. Scot asked Kathy for advice to those who are angry at God. She said anger is a natural part of the healing process. It shows that you have a relationship with God; just don’t stay stuck there. Once she thought of it that way, she felt the healing that helped her move forward. Fr. Peter said for someone to admit they are angry with God is an important step. It’s good to know that no matter how big my anger, God’s love is bigger. Fr. Chris said saying “I’m angry” is 90% of the healing process and the other 10% is inviting the Lord in with his healing and consolation. The Blessed Mother is another person to turn to for her intercession. She saw her own Son suffer so terribly and stayed at the foot of the cross. She is a wonderful intercessor and advocate. Kathy said moms and dads need to forgive themselves for any decisions they made that they might regret even if it wasn’t a mistake in itself. The Lord will take care of us and our children. Pray for the healing and forgive yourself. Scot said one of the main objectives of the Mass is to honor and provide healing. Kathy also honors her children by hanging Christmas stockings for them, by remembering them on Mother’s Day and Father’s Day. She said she still feels the loss and it’s natural to continue to feel loss and experience sadness. Kathy and Sean are now the proud parents of a 6-week-old adopted son, Declan Joseph.